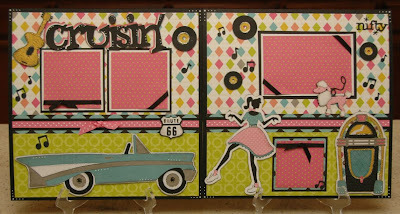 Monique Griffith Designs: Nifty New "Cruisin" Layout & Blog Candy! super, super cute! sure takes me back. . . Thanks Monique, have a new layout to put together now. Placing my order soon. Great layout. I love that cartridge but your use of so many elements together with great colors is truly an inspiration. Thanks for the chance to win. What a beautiful layout! I love the colors and all of the "extra" little details! 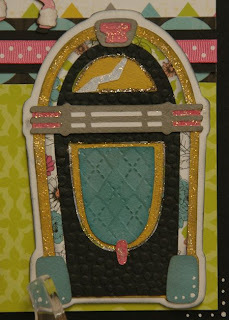 So glad you are back on your blog, I have missed all of your team's fabulous creations! Soooo Adorable! Love it!--Pat N.
So awesome! That poodle is my favorite :) Cute! I love this kit. So cute!! Hi Monique! I've missed you, I hope you are rested and doing well. Love the new layout, I just bought this cart yesterday. Adorable! I don't have these cartridges but what a great kit. Wow!! Wow!! Wow!!! This layout is just absolutely amazing!!!! Thanks so much for sharing. Can't wait to make it. Pictures from Steak 'n Shake will go nicely!!!!!!!!!!! Love everything you guys make here. So inspirational!!! This would be perfect for vintage photos. This is so adorable! Scene layouts are my favorite! Such a pretty happy layout. I just love it!!!! This is such a neat layout - I love the colors and that girl dancing, I can't say enough! Oh, this layout is just so cute. Love it. My first car was a '57 Chevy, so this layout would be perfect for the pictures I have of myself and my cool car! Wow Ms. Susan did a fabulous job on this layout I love it! I am so excited to see a new kit. Thanks for sharing. This is just amazing!! I love the layout, the colors, the papers, all the little details!! Just fantastic!! Adorable! So cute! Thanks for sharing your skills and imagination ladies! You did a tremendous job on the layout!!! :) I have the perfect sock hop pictures to put in it! What a wonderful layout! I'm glad you're team is back! This is a great layout, I am so glad you and your family are back ! Nana Susan is VERY talented! Love the layout, so cute! I just found you via the everydaycricut website and LOVE what I see. I will be adding you to my list of FAVORITE scrapping sites! :D Thanks for your GREAT ideas. Love the layout! I have always loved the 50's theme. love this and wouldn't you know...right for my age group!!! !i so remember those days. Love this layout! So glad you're back, you were missed! Cute cute cute. Love it. Very talented. Can't wait to see all you have been working on this summer. This is awesome. Great job! Thanks for the chance to win. Wow - Nana Susan has outdone herself this time. Love this cartridge and this layout. Have some pics from a sock hop from a few years back that would work perfect in this layout. Thanks for the chance to win! Love the layout-I have Nifty Fifty cart and love it. Oh boy this is absolutely beautiful. You guys need to do a simple class on creating layouts. Wow. Who wouldn't love this design! Thanks for sharing it as a kit and inspiration too! Oh my gosh! Another incredible layout. You are a step above most of us! The colors and added sparkles are fabulous. So very happy to see a new LO from your great team. Even happier to know YOU are doing so well, Monique. Ohhh so happy to see a new LO...and it is just great - certainly brings back great memories. I remember standing at the jukebx trying to decide which 'records' to play!!! Those were the simpler times! Nanna Susan, you are certainly a talented person!! I love this layout! Love the playfulness and colors you used. Thanks Nana! I love the latest layout. I've missed you, but understand you wanting to spend time with family. Great to see you back on a part-time basis. Love the layout. My hubby and I spend the summer in a campground in Cape May NJ and one beautiful evenings we take a ride around the lake and all in out golf cart. Want to use this layout to show that. 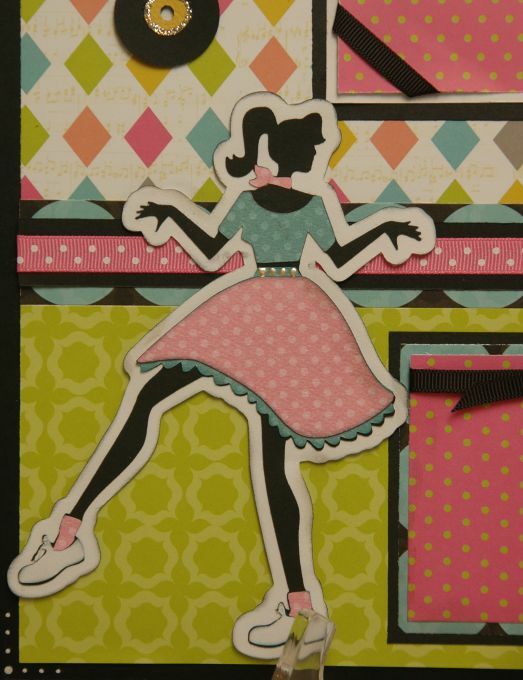 Love the scrapbook layout. Thanks for sharing and a chance to win. So excited to see that you are posting again! Glad you are taking good care of yourself and that everything is good for you. LOVE the new layout. Would love to win your Blog Candy! Thanks for offering a great prize! Wonderful layout! I'm sure it will be a big hit! I love this layout, takes me back to my teen days. Welcome back! 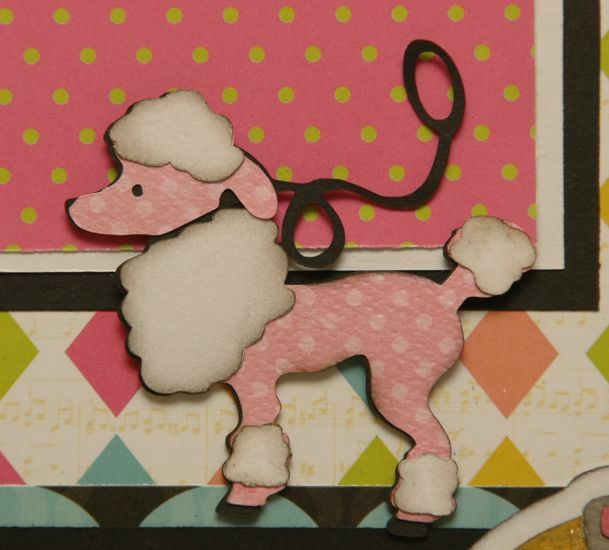 And happy LO -- my favorite part is the pink polka-dotted poodle pooch. I LOVE this layout...the colors, the cuts...everything!!! I see Nana Susan did it again!! This layout was so nicely put together. I just love it! This Cruisin' layout is amazing! I am in awe of the creativeness of Nana Susan! Absolutely fantastic! I'm glad to see another post from you...we miss you! I love the lo as always...Nana Susan, it's adorable! TFS! I need to get the Nifty 50's cart. beautiful LO as always, happy to see a new one your work is so inspiring! Thanks! This layout is awesome. Love the colors and all the cricut cuts. Wonderful job! TFS and the chance to win. Sooooo good to hear from you Monique. Hope you and your family are enjoying your summer. Nana did a great job on this layout. This is such a fun layout. I am so glad that you are back posting your fabulous creations. I can't wait to see your next kit. Fun layout design and great patterned papers. Love the poodle! What a cute layout! Love your blog and can't wait to see more soon! I will be there in the morning to pick up a kit! Can't wait to do this one, it's awesome!!! 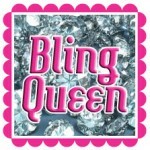 Ab Fab Layout Nana Susan!! Love it! So glad you're back Monique! I've missed you and your team's style and inspiration. Take care of yourself and family. Best wishes! Oh wow this is a great layout, I have quite a few photo's of my mum that this would suit lol. I am going to go through my mom's photos for this layout. I think it is so stinkin' cute! Can't wait to do it. What a truely fun layout! Thanks also for the opportunity to win some "blog candy"!! THis is so adorable! You are so very talented and much appreciated for sharing your talents with us. Also thanks for the chance to win the candy! Wish me luck! Very cute layout. Love all the details you include! Thanks for a chance to win! Great job Susan! Such a fun layout! I like the new layout and am so glad to see you back and updating the blog. What a great layout!!! :) And so many new kits-too exciting! So stinkin cute, I love it! Love your work and I check in often! That car is one sweet ride. I love this whole layout. I better get this cartridge! Super fabulous lo! I love the everything about it! Susan you rocked this out the park!!! Hope all is well Monique, sure miss your fun and inspiration. I love the fabulous layout and the colors. I don't have this cartridge but it is on my wish list. Thanks for sharing!! great lo. brings back lots of fond memories. What a FUN & GROOVY layout!!! 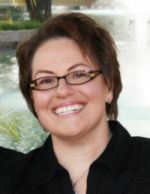 Nice to see you back Monique, we've missed you :-)... thank you guys for the chance to win some great blog-candy!